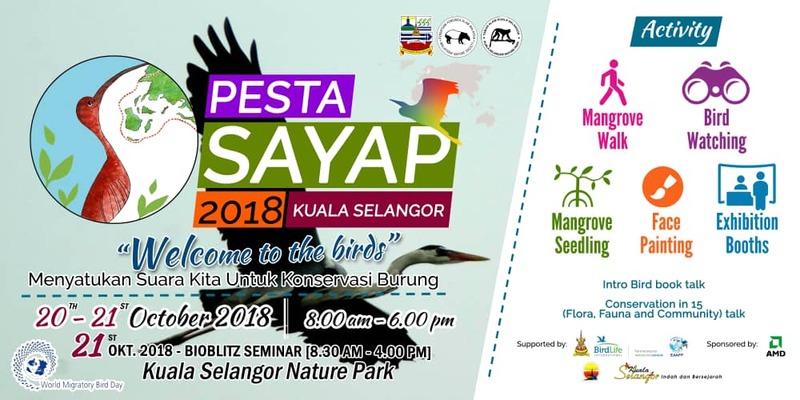 Running since 2004, Pesta Sayap 2018 is themed “Welcoming the birds” – Unifying our voices for bird conservation”. The public, MNS Members, birdwatchers and wetlands warriors are more than welcome to attend this day-long event, with its attendant nature walks and talks, exhibitions about MNS programmes and outreach, and plenty of activities to occupy the young and old alike. Bioblitz 2018 Seminar is organized by the Malaysian Nature Society on the 21st of October 2018 in conjunction with Festival of Wings. The seminar aims to present the latest data on the results of scientists and volunteers research on biodiversity in Taman Alam Kuala Selangor (KSNP). The presentation of the seminar will then be used as a supporting document for the preparation of Taman Alam Kuala Selangor as the new Ramsar Site in Malaysia. This seminar is an invite-only event and prirority is given guest speakers and associated MNS community groups. Those who are interested to join the event need to register via email to waipaik@mns.irg.my. Click here to download the event tentative.